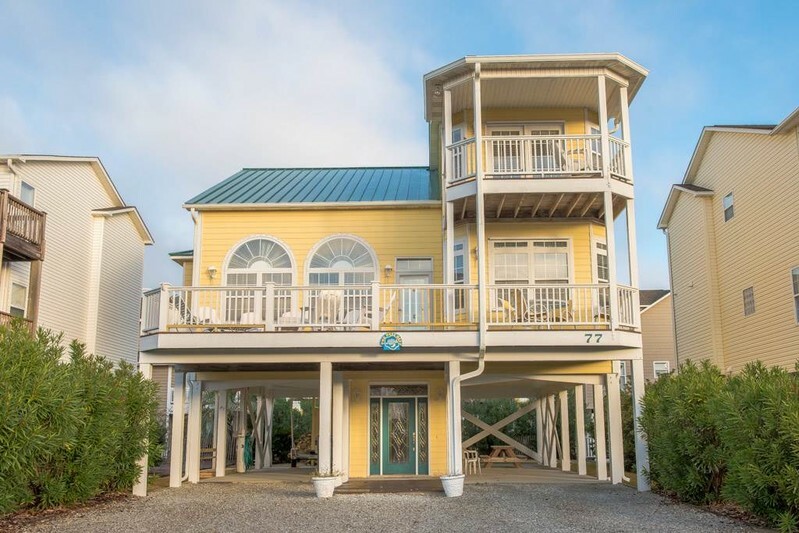 Welcome to this light-filled retreat ideally located within Summer Place on the West End of Ocean Isle Beach! Zesty citrus and brilliant coral and aqua interior colors keep you in beach mode during your holiday. This well-appointed 4 bedroom / 4 bath house is steps from the private community pool, and only 125 yards to the beach – you can see the ocean from the decks. Upgrades in 2017 include a ceiling fan in the master bedroom, which also has its own ocean-facing private deck. There are new flat-screen TVs in all the bedrooms, and new mattresses for the queen and king-bedded rooms, plus a new double bed in the upstairs bedroom. The kitchen is well supplied, including a new range – and yes – it has a Keurig! There’s everything you need for fixing anything from a bowl of cereal to a low country boil. Outside there’s a picnic table – or spread a blanket on the back lawn and enjoy dinner from the charcoal and/or gas grills. Happy hour drinks can be prepared at the wet bar in the great room and enjoyed on the deck. The common area also has a large flat-screen HDTV and DVD player. This house comfortably sleeps 11 as follows: Two bedrooms on the main floor with two doubles in one and a queen bed in the other. Upstairs there is a king-bedded master, and a fourth bedroom with one double bed and one single. There are four full-size bathrooms all with a combination tub/shower. Other conveniences include an outside shower and enough space to park 8 cars.